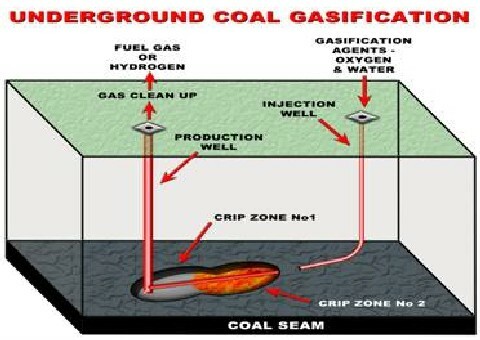 The British Gazette » Underground Coal Gasification. Our Best Hope? Truly, the British Isles are blessed. Not with wise, patriotic and benevolent rulers – we have to put up with the lying treasonous sycophants we have – but in the vast wealth that lies beneath our feet and off our shores. British Gazette readers will know of the coal reserves and the North Sea oil. They will know that most of the British coal fields have been closed down and only a handful remain in operation. What they may not know is that there are vast untapped reserves of coal under the North Sea the equal or greater than what lay beneath our feet. Of course, this coal has been unexploited for a very good reason. It was under the North Sea and far offshore! What they may not know is that a technology is being developed that could exploit the coal in the closed pits and also the as yet untapped vast undersea reserves. How? Underground Coal Gasification is how. Underground Coal Gasification (UCG) is a method of converting un-worked coal – coal still in the ground – into a combustible gas which can be used for industrial heating, power generation or the manufacture of hydrogen, synthetic natural gas or diesel fuel. UCG technology allows countries that are endowed with coal to fully utilise their resource from otherwise unrecoverable coal deposits in an economically viable way. UCG uses a similar process to surface gasification. Many British Gazette readers will remember “coal gas.” The main difference between the old “coal gas” is that in UCG the cavity itself becomes the reactor so that the gasification of coal takes place underground instead of at the surface – without the need and cost of mining. This is of particular relevance so far as the closed British pits are concerned. Although the coal is still down there it is practically unfeasible to reopen the pits. This is because the addits will have flooded, caved in or have gassed up. UCG however could easily exploit these reserves. The basic UCG process involves drilling two wells into the coal, one for injection of the oxidants (water/air or water/oxygen mixtures) and another well some distance away to bring the product gas to the surface. * Vertical wells combined with methods for opening the pathway between the wells. Tests in Europe in the late 1990s demonstrated it was possible to have greater control of deep drilling, to create larger cavities in the coal seam for the gases, and to provide more efficient combustion. In addition, while the process had previously been criticised for generating large quantities of hydrogen as a useless by-product, hydrogen is now in demand as a feedstock for the chemical industry and shows potential as an alternative fuel for vehicles. The advantages in the use of this technology – especially in the emerging markets of China, India and South Africa – are the low plant costs (as no surface gasifiers are required) and the absence of coal transport costs. In the last few years there has been significant renewed interest in UCG as the technology has moved forward considerably. * China has about 30 projects in different phases of preparation that use underground coal gasification. * India plans to use underground gasification to access an estimated 317 billion tons of coal. In 2007 India compiled a 93-page status report on underground coal gasification that highlighted interest from many of the country’s biggest companies. * South African companies Sasol and Eskom both have UCG pilot facilities that have been operating for some time, giving valuable information and data. * In Australia, Linc Energy has the Chinchilla site, which first started operating in 2000. Carbon Energy has completed a successful 100 day commercial scale study in Bloodwood Creek in 2008. Demonstration projects and studies are also currently under way in a number of countries, including the USA, Western and Eastern Europe, Japan, Indonesia, Vietnam, India, Australia and China, with work being carried out by both industry and research establishments. Unfortunately we in Britain are being left behind. Whilst the idiotic traitors running this country continue to look to Mr. Putin for the nation’s future energy supplies, they are ignoring the fuel right under their feet! Of course there is a “problem.” Well it is not a problem. It is just that these idiots think it is. You see, along with large quantities of combustible gas, large quantities of that well known destroyer of planets, CO2 is released! Of course these idiots insist that every last molecule of the CO2 will have to be separated off and pumped back down to where it came from! It makes one want to weep!!!!!! Now this is a very informative article, and the idiot in charge of our energy planning is one Chris Huhne. This Liberal millionaire is about to commit a £22bn fraud: Green taxes.